The roundtable will be in English. You are welcome to bring your lunch. Coffee, Tea and Desert will be provided. La table ronde sera faite en anglais Vous êtes invités à apporter votre dîner. Le dessert, le thé et le café sera fourni. Le 10e Forum sur les innovations technologiques et pédagogiques en éducation (ITPE) se tiendra le 6 mai 2019 à partir de 8:00 à la salle Currie au CMR. Vous êtes tous les bienvenus. Le premier conférencier sera, M. Peter Wolf, consultant en enseignement supérieur. Les personnes intéressées à présenter sont invitées à soumettre leurs propositions avant vendredi le 15 février 2019. Pour tout autres questions concernant le contenu de la proposition, veuillez communiquer avec le Dr. Holly Ann Garnett (Holly-Ann.Garnett@rmc-cmr.ca) ou le Dr. Mathieu Gagnon (mathieu.gagnon@rmc-cmr.ca). The 10th Technological & Pedagogical Innovation in Education (TPIE) Forum will be held on Monday, May 6, 2019 starting at 8:00 am in Currie Hall at RMC. All are invited to attend. The keynote speaker will be Mr. Peter Wolf, Higher Education Consultant. Individuals interested in presenting are invited to submit their proposals by Friday, February 15th, 2019. For any other questions regarding the content of the proposal, please contact Dr. Holly Ann Garnett (Holly-Ann.Garnett@rmc-cmr.ca) or Mathieu Gagnon (mathieu.gagnon@rmc-cmr.ca). 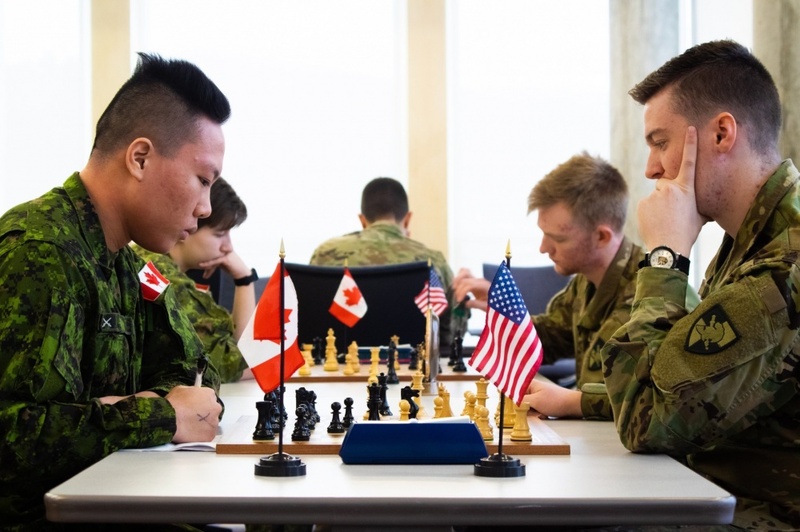 This past week, RMC hosted two Japanese Defence Academy cadets. 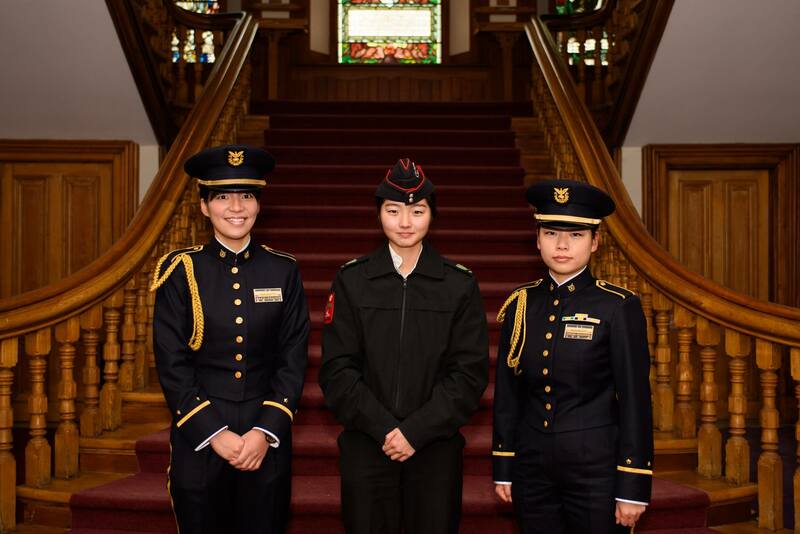 Cadets Miyuu Fujino and Homaru Ogasawara are here to experience the military university life in Canada and Canadian culture. 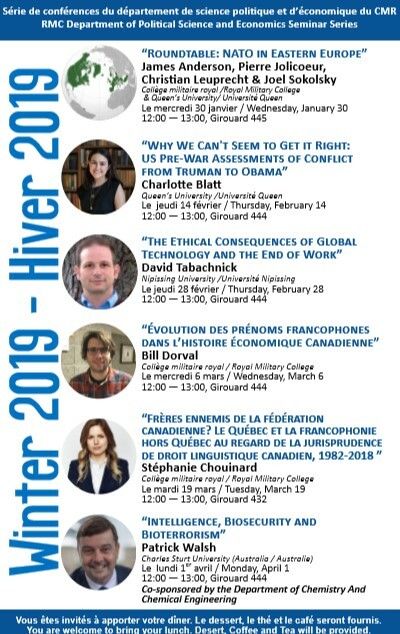 These exchanges are also a great opportunity for RMC students to make connections with allies and to learn what other military colleges are like abroad. In the picture with the two Japanese cadets is OCdt Reina Cho, their translator while they are here. Warm welcome to our Japanese friends and we hope you enjoy your experience here in Canada! Cette semaine, le CMR accueille deux cadets de l’Académie de la Défense japonaise. Les cadets Miyuu Fujino et Homaru Ogasawara sont ici pour faire l’expérience de la vie universitaire militaire au Canada et de la culture canadienne. Ces échanges sont également une excellente occasion pour les étudiants du CMR d’établir des liens avec des alliés et d’apprendre ce que sont les autres collèges militaires à l’étranger. Sur la photo avec les deux cadets japonaises se trouve l’élève-officier Reina Cho, leur interprète lorsqu’elles sont ici. Bienvenue à nos amies japonaise et espérons que vous apprécierez votre expérience ici au Canada! This past weekend (January 25 – 27), the annual Broomball tournament was held at the Royal Military College Saint-Jean. Over 20 teams in three different categories took part and worked their hardest to obtain the title of “First Place”. The tournament started with the ceremonial ball drop at centre ice. Once this was done, the tournament was officially started and the competition began… And a competition it was. Each game was played with maximum effort and, regardless of who was playing, spectators were promised a show. The games were intense, action-filled, and kept players and fans on the edge of their seats the entire time. One of the beauties of this tournament is the fact that, regardless of what team you’re playing for, or where you go to school / work, you know you’re playing for fun and you’re in Saint-Jean for a good time. I managed to form a team with some of my best friends and, despite us being from both RMC Kingston and RMC Saint-Jean, we came together as one and just enjoyed ourselves. Events like these have a way of allowing us to take a step back from the stressors of university-life and hang out together without the added stress of homework or assignments. Being someone who started their RMC journey in Saint-Jean, it felt good to come back with some of the people I met last year. Seeing the groups of people who were playing this weekend, and being able to observe their relationships, I’m confident that this will be a tradition for years to come, and I highly encourage anyone thinking about the weekend to come out and enjoy it. Even if Broomball doesn’t seem like your sport, or you don’t know how to play, you can’t say you don’t like it until you try it. Check back for photos of the tournament! The RMC wargames club competed in their first ever tournament, with multiple Cadets entering the 40k GT format at the Goldensprue Cup Warhammer tournament located at the Melvin Roads American Legion in Albany, New York. This tournament saw competitors from around New York and as far away as Texas and California, all braving the winter storm to pit their tactical wits against some of the best players on the east coast. RMC sent down four experienced members to test their mettle amongst the fierce competition: 27556 OCdt Banks-Batten, 28686 OCdt Klimchuk, 27808 OCdt Mcalinden and 27830 NCdt Moors. For their first tournament, the RMC wargames club performed admirably. At the end of the tournament, OCdt Klimchuk ranked the highest out of the RMC members putting up a valiant effort and scoring in the top half of all the competitors. OCdt McAlinden took home the award for Most Sportsmanlike (as voted by his opponents), and, overall, the members represented the club well with their polite and professional conduct. This was a fantastic opportunity for the members that attended; the experience gained was invaluable with each person taking home new tips and tricks to help better their performance on the table and their painting skills as well. This was the first tournament that the Wargames Club ever attended and was a great success! Hopefully, this will become a staple tournament for the club for years to come. 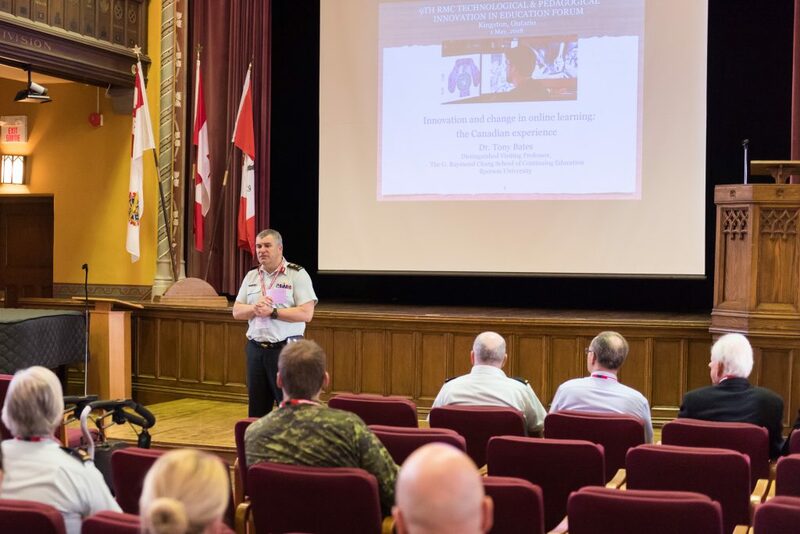 On Friday morning, the Director of Cadets, Colonel Chris Ayotte, gathered the Class of 2019 in Currie Hall to deliver a lecture on followership and leadership. His intent with this meeting was to reaffirm the basic expectations of military officers as well as to provide advice to the soon-to-be commissioned officers in their journey to becoming junior leaders. During his presentation, Colonel Ayotte addressed several important topics, including the maturity expected of leaders, putting service and others before self, respecting authority, and holding oneself to high standards. To illustrate each point, he called on the Fourth Years to share their insights and, in turn, he shared stories from his wealth of experience. Throughout the presentation, the DCdts showed several motivational videos from speakers like Jocko Willick, a retired Navy SEAL commander, and Admiral McRaven, the former commander of the U.S. special forces. These videos, mostly of accomplished soldiers whom the DCdts himself admires, also provided the senior class with important leadership lessons. The presentation concluded with a question period, whereby the DCdts asked the Fourth Years to share their opinions on topics related to moral courage, defining success, and dealing with subordinates’ concerns. Overall, the Class of 2019 was fortunate to have such an informative, open, and honest lecture from the Colonel. Going forward, it will be vital for us to keep open minds and continue to grow as professionals and people. As a follow-up of last week’s PD, Third Years got the opportunity to show off our back briefing skills to our Squadron Commanders this week. Topics for these back briefs varied from plans to facilitate an effective First Year Orientation Program to the execution of a well-organized Commissioning Parade. We were able to receive feedback on our back briefs in order to improve in the future. In terms of back briefing, this exercise sets us up well for our careers as we will have to perform back briefs when given a task by a superior. This week we had the first hour to go through the last of the presentations we had to do in order to confirm our lessons. In the second hour we met with the Division commander in order for him to get news from us and for us to ask him questions. I always appreciate this time because it allows us to get answers for some pressing concerns that the Division Commander or Sergeant Major can answer or bring up to their superiors. PMT on the 23rd of January 2019 was an ethics brief for the First Years. The brief mainly contained how to make ethical decisions, how to recognize an ethical problem, and three case studies presented by Fourth Years containing ethical dilemmas. The case studies were a nice addition to bring real world topics to help the first years have a better understanding of the topic at hand.